Floating LNG vessels are emerging as a solution for harnessing gas from mid-size fields remote from offshore infrastructure. But there are many smaller offshore fields that do not justify the huge vessels that Shell and Petronas have commissioned for their current projects off Australia and Malaysia. Fincantieri Offshore is working on an alternative concept for a ship-shaped compressed natural gas carrier – the CNG32000 – that could economically transport gas from stranded fields, compressed onboard to a pressure of 166 bar (2,407 psi), to a standard onshore unloading station or an existing regasification plant up to 1,500 mi (2,414 km) away. Aside from providing a market for gas that might otherwise sit in the ground, the concept opens other potential benefits to offshore operators. One is avoiding the expense of installing a gas pipeline in the case of an oil field with associated gas, or having to re-inject the gas into the reservoir. Another is an economic means of disposing of gas from extended offshore well tests, ensuring compliance with restrictions on flaring. There are numerous competing compressed natural gas (CNG) concepts, but according to Roberto Gonan, Head of Basic Design at Fincantieri Offshore, none are sufficiently matured to be considered for industrial production and vessel applications. Fincantieri started work in earnest on the CNG32000 in 2013, initially studying various containment systems, methodologies, and ship configurations. 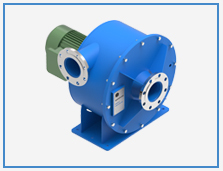 It developed the concept in its present form in 2014, and has performed all work to date in-house. The ship is designed for a 20-year lifespan. Its main dimensions include an overall length of 220 m (722 ft); a molded breadth of 40 m (131 ft); a design draft of 7.2 m (23.6 ft); and a deadweight of around 6,700 metric tons (7,385 tons). Its total CNG transport capacity during a single voyage under standard conditions would be around 6.34 MMcm (223.9 MMcf) at 166 bar (2,407.6 psi) and a temperature of 25°C (77°F). This would be stored in pressure vessels grouped together in around 500 racks, stationed in 10 cargo holds (50 racks each). 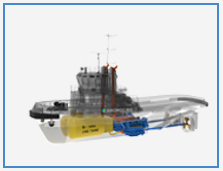 Next to the cargo holds, the mid-body portion of the ship features a double hull and a double bottom, the inner part of which is used for ballast water tanks. Toward the aft section is the accommodation block, housing 21 crew members, in a superstructure above the main deck containing the engine room. Two 4.5-MW Azipod propulsion units combined with a bow thruster maintain the ship’s position during offshore tandem loading operations. Power is provided by three diesel generators with dual-fuel engines, each outputting around 4.3 MW. A back-up generator is stationed beside the accommodation block above the main deck. The fore part of the vessel has a bulbous bow. 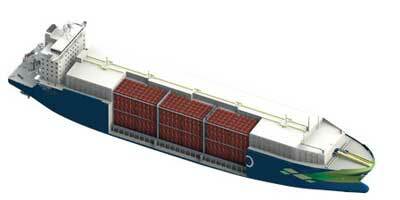 Here the CNG handling system and compressor are located, above the main deck and forward of the cargo holds. 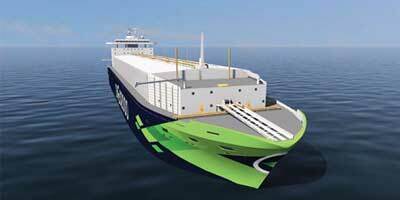 “Initially,” Gonan explained, “our main focus was on the compressed gas containment and cargo handling systems. We took into account and compared several different building materials, assessing physical properties and chemical compositions. We also looked at market availability aspects and economic applications. 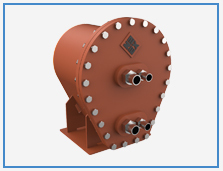 The compression system has been designed to allow the ship to receive gas at various pressures and store it in metallic pressure vessels. 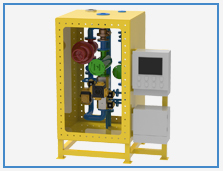 The main components are the compressors, similar to those used in re-liquefaction systems in LNG carriers; thermal expansion valves; coolers; heaters; and remote control valves. 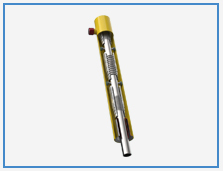 Some competing CNG concepts are based on storage pressure of 250-350 bar (3,626-5,076 psi), much higher than the current target for the CNG32000. 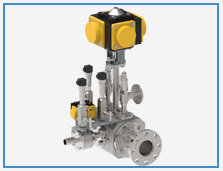 According to Gonan, “there are both economic and energy benefits in compression between 140 and 160 bar [2,030-2,320 psi], compared with design pressures of 250 bar and above. Prior to entering the ship for compression, the produced gas would need to be pre-processed. Any hydrogen sulfide would have to be eliminated for safety reasons and any carbon dioxide would have to be kept below a certain percentage in order to guarantee the calorific properties of the gas and the heaviest hydrocarbons separated while under pressure. 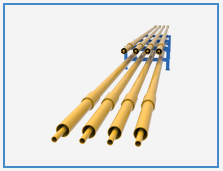 Arrangements for loading/unloading are provided in the forward part of the ship, comprising two manifolds with longitudinal bow connections suitable for offshore tandem loading. A hawser would be deployed to secure the ship and flexible hoses during cargo transfers. Transversal connections – two portside and two starboard – are also arranged forward for cargo transfer at the port quayside reception terminal. Cargo loading/unloading would typically be completed in less than a day, Gonan estimated. “This assumes the gas would be received from the source (i.e the offshore production platform) at 60 bar, and delivered to the onshore terminal at 60 bar as well.” Offshore tandem loading operations could be performed even in rough seas, he added, although this remains to be validated in tank tests.